This scrapbook biography of primary documents creates an encompassing portrait of a soldier, his family, and a war. A scrapbook created by the author to understand his brother’s death in World War II, Moonlight Over England is an unusual biography in its form. In a collection of photographs, documents, letters, and flight manuals, Eric P. Donald creates an intimate look at his older brother Norman’s life. 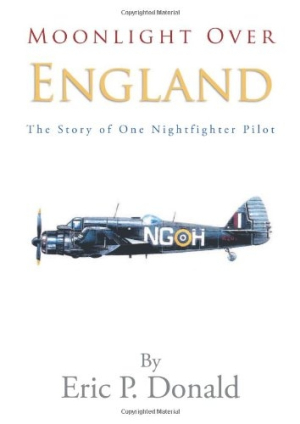 Norman goes off to war as a pilot testing the British program and aircraft for aerial night fighting in order to stop German bombings of London. His story begins with a map of Great Britain—on which his home town, Sunderland, is marked—and ends with a pilot’s manual for the Albemarle Aircraft. The time in between is related by the documents themselves. “Because my brother never came home again, I have had a recurring dream of his return, which always ends when I ask him where he has been all this time.” With this, the author sets the personal tone for the album. Norman and his crew were killed in a crash near Gloucester, but details were never known. The author, twenty-five years later, is an aircraft designer and set on determining the facts of his brother’s death by gathering information, all reproduced here. With no narration and very little commentary by the author, the reader is left alone to work through the story presented in the pages of a scrapbook. Relying mainly on source materials, Donald creates an encompassing portrait of a family in war-stressed Britain. Daily life endures, and the pride of a family in its son protecting the country is obvious. Sunderland, the Donalds’ hometown, is bombed, adding to the anxiety of having a son and brother at war, and the personal documents bring the immediacy of war home to the reader. The material is fascinating but also limiting. The lack of narrative or descriptions linking entries leaves the reader alone to make sense of what is on the page, which will likely limit the audience for this book. Working through Moonlight Over England requires patience by the reader to realize its value. But the photos, diary entries, letters, and technical data on the aircrafts that were tested and used in the effort to clear the skies over Britain during the dark days of World War II bring a perspective that can be more encompassing than a straight narrative biography. The author has put together a very personal look at life in Britain during the war years. Unfortunately, some of the meaning gets lost in the lack of narrative translation.